Since the tragic death of Eight Belles, the industry response has bordered on mind-boggling. Rather than opening ourselves up to intellectual honesty and self-examination, most have bared their teeth and defended an industry that screams for reform so as to not arm those who call for its banishment. At the outset, let me first acknowledge my own shortcomings. After all, it’s only at the personal level that change can originate, and I think we can all look at our breeding programs and identify cases where we have perpetuated the problematic American thoroughbred. At times, I have purchased mares with known soundness problems and sent them equally unsound sires or stallion prospects. The lure of a brilliantly fast offspring, no matter how brief the career, has baited me successfully on more than one occasion, as has the possibility of a commercial home run. The last thing I want to do here is appear condescending. There is little doubt that the issues surrounding durability are multiple and complex. Medications, steroids, and racing calendars are certainly contributing factors, the degree to which each plays a role is open to debate. However, in this writer’s opinion, the single most important factor has been the commercialization of the breed where a horse need only prove they’re sound enough to walk through a sales ring for their breeder to make money. In the days following Eight Belles death, industry and media discussions centered on racing surfaces, trainers, jockeys, medications, steroids, and to some extent, bloodlines. Unfortunately, ‘bloodlines’ was seldom equated with the dominating and damaging presence of the commercial market. And as a result, those who cash out in the sales ring with little regard for the long term health of their horse have avoided the appropriate scrutiny. The only real hard-hitting piece (aside from PETA’s web site and press releases) came on May 17th from the renowned Sports Illustrated columnist Bill Nack. The piece follows in it’s entirety and should be read with an open mind and a healthy dose of humility by all who claim to value this wonderful industry. Originally appeared May 17th on SportsIllustrated.com. Written by Bill Nack. No, Ellen Parker is not given to eerie premonitions. Now 61, she has spent most of her adult life studying and analyzing blood-horse pedigrees; and for years, she’s been consulting clients and arguing vociferously in her newsletter, Pedlines, on the need for thoroughbred breeders to aim for soundness, for durability, as they plotted their matings. She has often sounded, in this equine world driven now by speed, greed and the soulless dictates of the marketplace, like the voice literally crying in the wilderness. What so concerned her on the eve of this Derby, what she found so disturbing, even infuriating, traced to her unshakable belief that Eight Belles was carrying in her DNA the seeds of her own destruction. Specifically, in the pedigree of this speedy gray filly, Parker had seen the same kind of dangerous crosses — in her case, lines of known unsoundness triply crossed behind an unsound sire line — that she believed had contributed to the racetrack breakdowns and deaths of such prominent horses as Ruffian and Go For Wand, of George Washington and Pine Island, and even of Barbaro. Indeed, when Ellen Parker first perused the bloodlines of Eight Belles, she saw a danger clear and present: a family tree that bore three branches of the extremely brilliant but unsound racehorse Raise a Native, who was a very muscular chestnut, heavy on the front end, who had won all four of his starts before he broke down in front and limped off to stud. Raise a Native came by his lack of durability quite naturally. He was the fastest son sired by the equally brilliant Native Dancer, racing’s immortal “Gray Ghost,” whose record of 21 victories in 22 starts was spoiled only by a loss to Dark Star in the 1953 Kentucky Derby. By the time Native Dancer had reached age 4, when he started only three times through August, he had gotten so sore due to a chronic inflammation in his ankles — he reportedly had developed osselets, bony growths along his ankle joints — that his owner and breeder, Alfred G. Vanderbilt, was forced to retire him to Sagamore, Vanderbilt’s Maryland farm. There, The Dancer rose to become one of the most successful and influential progenitors in the history of the breed. Through one grandson, the prepotent Northern Dancer, he helped found the most popular and prolific sire line in the world; and through another grandson, the exceptionally fast but unsound Mr. Prospector — yes, a son of Raise a Native — his name gradually appeared at the roots of a far-flung web of sire lines and families that rivaled Northern Dancer’s. And herein, ladies and gentlemen of the jury, lies the rub. The thoroughbred breed is now so suffused with the precocious blood of Native Dancer, so filled with his great-grandsons and great-granddaughters, so shot through with distant offspring who carry the markers of his tribe — extraordinary speed with limited durability and soundness — that today it threatens the viability of the entire breed. Of the 20 starters in the May 3 Kentucky Derby, every single one of them carried the blood of Native Dancer. Of course, this line in and of itself is not to be condemned — if, that is, it comes in reasonable doses and is counterbalanced by the blood of sounder strains — but in many of the Derby pedigrees, he appeared multiple times. Native Dancer appeared four times in Eight Belles’ pedigree, most conspicuously in the three crosses of Raise a Native that so troubled Parker when she saw them there. 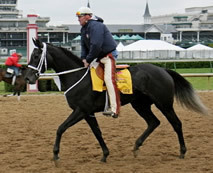 When Eight Belles shattered both of her ankles as she pulled up past the finish line and galloped out around the clubhouse turn — she obviously broke one ankle first, then snapped the other as she dug it in to support herself — Parker was but one of millions who sat transfixed in horror as the television camera showed the filly lying prostrate on the track. The recriminations began at once. Columnists, bloggers, talk-show hosts and other observers, some of whom actually know which end of the horse eats, launched into a series of spontaneous public lectures detailing what the problem was and what had to be done. Members of People for the Ethical Treatment of Animals (PETA) picketed the offices of the Kentucky State Sports Authority in Lexington and flooded the organization with e-mails protesting the sport. They unjustly condemned the trainer for running the filly and the jockey for using his whip, however sparingly, the last eighth of a mile. What Ellen Parker wanted to know, when I spoke to her following the Derby, was why no one was picketing Robert Clay’s Three Chimneys Farm in Midway, Ky., one of the pillars of the Blue Grass breeding establishment and the place where Eight Belles was bred and from where she was sold as a yearling, at Keeneland in 2006, for $375,000. All 20 starters in this year’s Kentucky Derby could trace their bloodlines back to Native Dancer, shown here with owner and breeder A.G. Vanderbilt after winning the 1952 Fall Highweight Handicap. What is clear right now, in the wake of Eight Belles’ death, is that horse racing has arrived at yet another wrenching moment of crisis and self-examination, one even more critical than the first one I experienced more than 30 years ago. That was on July 6, 1975, when the fastest filly that I ever saw, the undefeated Ruffian — in a nationally televised match race with Foolish Pleasure — pulverized the sesamoids in her right front ankle and had to be destroyed. Like Eight Belles’, Ruffian’s pedigree did not guarantee her demise, but it certainly telegraphed her vulnerabilities to breaking down under the most extreme physical pressures that the sport can offer. Ruffian’s soft-boned sire, Reviewer, had broken a leg three times while in training as a racehorse, and had to be destroyed after breaking down a fourth time in a paddock accident while serving at stud. And, as Parker has pointed out more than once, Ruffian’s dam, Shenanigans, was a daughter of Native Dancer. So she had the same genetic predisposition for unsoundness hanging from the top and bottom branches of her family tree. “Ruffian was an accident waiting to happen,” Parker lamented. In 1993, after watching Union City break down in the Preakness and then the Preakness winner, Prairie Bayou, shatter bones in the Belmont three weeks later — both horses were euthanized on the track — I reported and wrote a long investigative story for Sports Illustrated in which I found that, over the past few decades, a sea change had occurred in the breeding of thoroughbred horses, leading to a genetic weakening of the breed, a softening of the horse as a racetrack competitor and the increased use of a variety of drugs, some legal and some not, to keep this weakened, softened animal competitive on the track. Through the first 60 years of the 20th century, most of the major stallions and many of the best mares were owned and controlled by some of the oldest families and richest sporting patrons in America, by the Whitneys and Woodwards, the Bradleys and Wideners, the Klebergs and Mellons. They bred horses to race them, not to sell them, and they did so in order to compete against one other — to beat their fellow members of The Jockey Club, to see who had the fastest horse. A cardinal article of their faith was to “improve the breed,” which meant to breed a horse with great speed, stamina and soundness. In fact, on the C.V. Whitney farm in Lexington, a foal born with a crooked leg was usually taken into the woods and shot, lest he or she pollute the Whitney bloodlines with this inherent deformity. By the middle of the last century, this tight-knit racing world began to change. As these families died out and their blue-chip breeding stock was sold at dispersal auctions, the best stallions and mares fell into the hands of commercial breeders, whose central motivation was to breed, not so much a sound or durable horse, but rather an attractive horse, a “cosmetic horse,” who showed well, who had a pedigree filled with fashionable names, preferably sire lines that glowed with speed, and who thus would draw the biggest price at the fanciest yearlings sales. Because they needed to look like show horses, these hothouse yearlings were often raised in small pens and not allowed to run free, or to kick, bite and roughhouse with their peers. So, not only did the industry begin to breed horses less sound, in general, but also horses that were raised more softly, with kid gloves. John Nerud, the 95-year-old former manager of Tartan Farm, a private stud in Florida, points with pride at all the wonderful racehorses he bred and raised and retired sound, horses like the great Dr. Fager and the sprinter Ta Wee. What has happened, with the passage of years, is that the thoroughbred is no longer the resilient, hard-boned, robust racehorse that he was in the days when horses were starting 40 or 50 times in a career — back, for instance, when the great 1940s handicap star, Stymie, started 131 times in six years of racing, a physical impossibility for any horse today. The horses who are populating the studs these days tend to retire with far fewer starts, their durability and soundness be damned. Nerud would never have bred a mare to such an animal in the past. Indeed, in North America, the average number of yearly starts per runner declined from 11.31 per year in 1960 to 6.37 per year in 2006. These three sires form the foundation of the thoroughbred breed. The American counterpart to “The General Stud Book,” called “The American Stud Book,” was first published in 1873 by a chap named Colonel Sanders D. Bruce, a Kentuckian, who had spent his whole life researching pedigrees of American thoroughbreds. In 1896, Bruce’s six volumes were taken over in America by The Jockey Club, whose offices are in New York, and formed the U.S. stud book. “Integrity of The American Stud Book is the foundation on which Thorougbred breeding and racing in America depend,” states The Jockey Club. These stud books are closed. If you look at the extended pedigrees of any racehorse in America, there is not a single name that does not trace back to the original female familes or to one of the three foundation sires, most of them (90 per cent) to Eclipse, who was dominant. In the U.S., every name in every pedigree — no matter how far back you go — is registered as a thoroughbred, a pure thoroughbred, with The Jockey Club. By closed, I mean that no mutt can get into the registry. When Secretariat was going to stud at Claiborne Farm, he was test-bred to an appaloosa mare, but the resulting foal, born in Minnesota, was a half-breed who could not be registered as a thoroughbred. Nor was this meant to be. It was a test to see if the horse was fertile. The Jockey Club, which approves the registering of all thoroughbreds, would consider this foal to be a “warm blood,” as opposed to a pure bred or hot blood. To strengthen the breed with other, sounder strains, those in charge of registering thoroughbreds would have to “open” up their stud books to allow these slower warm bloods in; and as Ellen Parker says, that ain’t gonna happen. Breeders are stuck with what is in there now. The Jockey Club sees itself as a guardian at the gate, protecting the purity of the breed from the mongrel hordes, the Quarter-Horses and Standardbreds and all the other hybrids who eat grass. Intruders are not welcome. Post no bills, Tonto. Take a hike. This gradual softening and weakening of the breed has led to the use of more medications to keep these horses running sound, among them the corticosteroids injected into injured knees and ankles. The cortisone reduces inflammation and allows horses to run pain-free on the damaged limbs or joints, a dangerous practice, if done repeatedly, because it can lead to a more serious injury and to the much-feared catastrophic breakdown. When I started going to races in the 1950s, I hardly ever saw a fatal breakdown on the Chicago dirt tracks; but when I started covering the sport in 1972, in New York, I began seeing numerous breakdowns during a race meet, sometimes two or three a week. One veterinarian told me that this was no accident, that this was the time period when cortisone began to get widespread use on U.S. racetracks, the first signal to me that drugs were a culprit in the sudden increase in catastrophic breakdowns. Drugs are only one way that the industry has been trying to make up for the weakening of the American thoroughbred. A number of racetracks have already replaced their dirt tracks with softer Polytrack surfaces, for the purpose of reducing breakdowns, but all we know about these tracks is that they often are the bane of true speed horses, favoring come-from-behind plodders. They have made the outcome of races so unpredictable that they have driven the high-rolling, sophisticated gamblers away from the betting parlors; and they may or may not save horses’ lives. The jury remains sequestered. All such expedients are aimed at forgiving commercial breeders for what they have done to the breed. At the core of the problem is the fact that the fastest and most popular sire lines in the world are the least durable and sound. The many lines that branch out from Native Dancer include names that fairly light up a yearling catalogue page and bring the highest prices, and Parker sees their presence and influence so much on the rise — so much Northern Dancer and Raise a Native, so much Danzig and Danehill, so much Nureyev and Sadler’s Wells, so much Storm Cat and Storm Bird — that she fears a gene pool grown narrow and dry, one in which it will be impossible to find a sound, viable outcross unless the grand pooh-bahs open up The American Stud Book, which has been closed to anything but purebred thoroughbreds for more than 100 years. What base is left will be tuned in on Saturday for Big Brown’s charge to win the Preakness. All the folks involved in the game, of course, will be wringing their hands at the start, wishing for Brownie not only to continue his attempt to sweep the Triple Crown, which has not been won since 1978, but also to pull up sound and in one piece. Memories of Barbaro at Pimlico are still raw. So, especially, are remembrances of Eight Belles at Churchill. Big Brown is inbred to Northern Dancer. His sire, Boundary, is by Danzig, a son of Northern Dancer who was known for his bad knees; and Brownie’s dam, Mien, is by Nureyev, another son of Northern Dancer. But the Derby winner also has been gifted with the sound blood of other lines, from old warriors like Round Table and Damascus, and may they carry the horse, and finally the day, in Baltimore.